Castle Huntly must surely command one of the finest vantage points over the Carse of Gowrie from its turreted windows some 130 feet above the flat fertile landscape. To the north-west can be seen the hills of Rossie and Evelick, to the south-west, Kinnoull on the outskirts of Perth is clearly visible. Out of the southeastem horizon rises the north coast of Fife with the Lomonds and Normans Law punctuating the skyline. The Firth of Tay disappears into the north-eastem horizon with Dundee on the north shore and the small villages of Fife on the southern shore. The tower house, of which Castle Huntly is a particularly fine example, owes as much to the social and political environment of the 15th century as to its physical location. Centralised administrative control on the part of authority came late to Scotland, as did the Reformation: the vast Church lands, and the lands of those who fell into disfavour with the Crown were being apportioned out to a new class of landowner, the gentry or lesser nobility. In Scotland fortified houses were not only necessary, but mandatory. The Crown insisting that such be built as a condition of granting the charters for the lands. The perception being, that such houses would assist in the stabilisation of a truculent populace. The first chapter in the tale of Castle Huntly is of one such family, the Grays, and their part in the rich heritage of Scotland. The second chapter reflects Scotland’s associations with Continental Europe and the age of enlightenment. Civilisation and elegance were the watchwords for a nation, typified by the Lyon family, which was confident in its attributes and growing prosperity. The third tale is that of the Pattersons. The last remnants of the old feudal order was falling away and the British Empire was waiting to be conquered by men and women of ability. An ideal task for the Calvinistic Scot, where hard work and endeavour reaped a rich harvest. It is in the last chapter that the tale differs from that of so many other fortified houses. Not for Castle Huntly the crumbling ruin, but a building with a purpose, a building which is needed and most of all a building which has spirit. Castle Huntly is situated at the eastern end of the fertile and rich river Tay flood plain known as the Carse of Gowrie. When approached from the west it appears to grow out of a rocky knoll taking its shape from the surrounding landscape, as if part of the living rock, defiant, sombre and austere. When approached from the north, climbing the steady incline, the complexity of the shapes and forms of the building are slowly revealed as one’s field of vision is gradually absorbed and the eye settles on some detail of the stonework or architecture which may never have been noticed before. 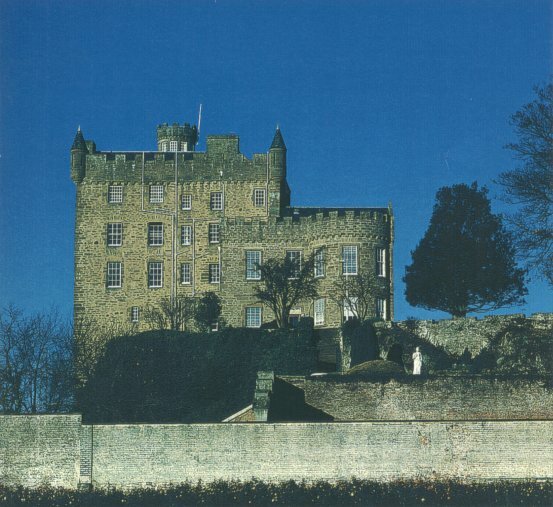 The eastern approach is one of expectation, the two Georgian wings with crow stepped gables and false windows, the dignified front entrance the backdrop of the old tower house, the high bartisan towers and the castellated parapets all urge the visitor inside the building to explore its secrets and relax in its hospitality. The finest elevation is from the south. It urges the visitor to step back and absorb the panoramic canvas laid out before the eyes. The true majesty of the historic keep is fully exposed as is the elegant curving extensions. The tree clad steep incline adds contrast to the gentle, golden-pink Kingoodie sandstone It is from the south, the terraced gardens can be experienced as can the old brick walls of the kitchen garden. The whole vista changing as the sun passes through the sky, giving the castle an air of eternal tranquillity. Although the present structure can be traced back with some confidence to the fifteenth century, there is some suggestion that the site may have been occupied as far back as the Bronze Age. Even to the casual observer the topography of the immediate area would be seen to offer many attractions to primitive peoples. The place name Longforgan goes back beyond written record but is considered to derive from Lon-for-gron in the old British language which was spoken in the district before the gradual migration of the Goidelic tongue. The name is said to mean the flat land above the marsh, which would have been a very apt description for the Carse before land management was to see it drained. Until the early Eighteenth Century the land to the south was waterlogged and marshy with numerous water holes and heavy clay soil, but, to the north the ground slopes gently upwards from the 150ft contour giving a fine southern exposure of good fertile land with natural drainage. There is direct evidence of early occupation. A fired clay beaker found near the present policies of the Castle dates from about 1,700 BC; over a century ago a burial cairn, belonging to the late Bronze Age was excavated just north of the village: a souterrain or underground chamber which would be in use in the early centuries AD was discovered in the west end of the village in 1955; the local parish church can be traced back to a religious foundation of about AD 500 All these point to a continuous habitation of the immediate vicinity of the Castle. Though direct evidence on the precise origin of the village is lacking, the history of the lands of Longforgan can be traced back for the past eight hundred years. In the 12th Century mention is made of four Royal manors in "Gowerin or Gowry one of which was Longforgan and from then onwards the name appears frequently in the records. It was already long established at the point at which the history of Castle Huntly itself begins. When in 1452 the first Baron Gray of Fowlis received a licence from James II permitting him to build a fortalice on any part of his lands, he certainly chose well. His castle stands on a volcanic knoll of dolerite intruding through the old red sandstone and rising about 50 feet above the level of the Carse, a commanding position with an uninterrupted view over miles of the surrounding country. To the south is seen the broad estuary of the Tay with the background of the Fifeshire hills and to the north the land rises gradually to the Sidlaws in Angus. East and west lie the broad lands of the Carse. On the north side the knoll falls away in a gentle slope while to the south-west there is a 50 foot drop of sheer cliff. Today, with a large number of trees growing around the site and a peppering of houses, it is difficult to imagine the commanding and austere picture of the castle as it would be in the 15th century, when owing to its marshy condition, the area would be practically treeless. Although the castle was built in the traditional tower and jamb defensive style and one can imagine the perilous expedition necessary to gain entry by force, there is no record of it ever being used defensively as a stronghold. The Gray’s other strongholds at Fowlis and Broughty being seen as more secure propositions.